Not very smart on the computer so hope I have this right. Here is a photo of the back pack. Because of the many criminal offenders out there I could not use her full name so just used her initials ITB. The lovely shadow embroidery designs are brought from Mandy Feck of Embroidery projects and they sewed out just beautiful and I settled on just the word Ballerina. Her baby sister just 4 years has just joined to so will have to make another baby one for her birthday in October. You have done it absolutely right and it is much appreciated. Thank you so much for sending in a photograph, this has really made my day. I hope you don't mind me sharing the photograph on my website, as I think your designs could be an inspiration to other dancers. Being very interested in art and design myself, I am truly delighted to see your designs and I think you have created an absolutely wonderful back pack. The initials of ITB is superb, it brings a great style to the bag and makes it look very unique. The silhouettes of the dancers bring a lovely elegance and I love these shadow embroidery designs. The colours are fabulous too, I especially the warm red tones as it gives the bag such vibrance. The single word Ballerina is just perfect - definitely the right decision! You have created a truly beautiful bag, I am a great fan! I am very pleased you will have the chance to make another baby one for her baby sister. You will have to keep in touch and keep me up to date with what you produce, as I would love to see more of your wonderful designs. Thank you, you have made me very happy! Is there a name for little ballerinas? I'm making a back pack for my little grandaughter to carry her gear to practice in and I want to put some embroidery on it. Is there a special name or saying like Prima ballerina for little ones? What a wonderful idea, I can imagine your granddaughter's back pack will look so beautiful once you put the embroidery on. I cannot think that there is a particular name especially for young ballerinas, so I think Prima Ballerina is an absolute excellent name to use for the embroidery. Some other ideas could be 'Ballerina', 'Little Ballerina', or 'Ballet'. You could also personalise it with her name, or have her name followed by 'Ballet Bag'. However, I am taking a liking to 'Prima Ballerina'. I can picture this name would look adorable on your little granddaughter as she skips off to her ballet class. Here is a brief history of the title 'Prima Ballerina', I thought it would be interesting to you.... A Prima Ballerina is associated with the leading female dancer in the ballet company. The name of Prima Ballerina is used as a sign of respect for distinguished dancers who have had a highly significant career. The title was first inspired in the early Romantic Ballet by the Italian ballet masters. 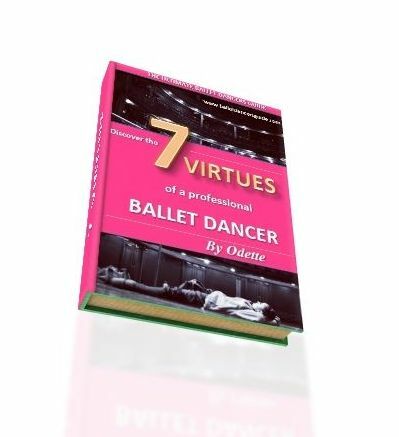 It was given to a ballerina who was respected and seen as especially talented. It is a name that has great honour and is typically symbolic. There are many examples of Prima Ballerinas, including the legendary dancers Anna Pavlova and Marie Taglioni. Yet also more current dancers like Darcey Bussell and Sylvie Guillem. I would absolutely love to see the final outcome of your embroidery. Please do let me know what name you decide. It would be fantastic to see a photograph of the finished piece, so feel free to send me in a picture, I would love to see! I have been looking at your site and noticed the baby ballet back pack and was wondering if you have a pattern for this, I have a granddaughter and great niece I could make one each for and who would absolutely love one. Thank you for contacting me. It is a pleasure to hear from you. 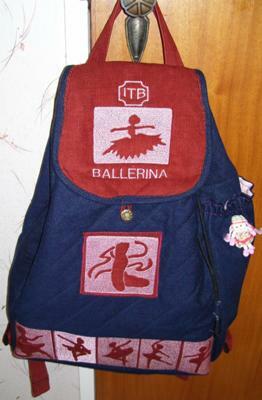 I agree with you that the baby ballet back pack is absolutely beautiful. What a great idea to make one each for your granddaughter and great niece. The back pack was submitted by another visitor, so it best to get in touch with them for more details on the pattern.